Numbers don't lie. Colca Canyon, 3270 meters deep belongs among the deepest canyons in the world. The depth, huge condors flying above visitor's heads and reasonable driving distance from Arequipa, the second most populated city in Peru makes from Colca Canyon one of the most visited attractions in this South American country. Although we don't know the exact numbers how many travelers make it to Colca Canyon every day, one thing is sure. The concentration of tourists per square meter was the highest when we compare it to other places we've been to so far in four months in South America. The settings of Colca Canyon is gorgeous, no denying. When arriving at the canyon from Arequipa, you will pass a few small villages (unfortunately I cannot say traditional villages although the inhabitants still dress traditionally), and you can sense the proximity of the canyon once you spot the Andean valley and green terraced fields on both sides of a big depression. Because we also visited Amazon in Peru, we found interesting, that Amazon River has its source in the mountains close to the Colca Canyon and we could even see the main peak Nevado Mismi from the other side of the valley! But despite the beauty and the exceptional depth, is it worth to visit Colca Canyon only on a one day tour? When traveling, we usually don't visit places only to be able to say we saw it, mission accomplished, and we always try to stay a bit longer when possible to get to know the destination better. But when we arrived in Arequipa, we knew we wouldn't be able to stay longer to explore Colca Canyon properly as we had the Inca Trail and Salkantay Trek near Cusco already booked. That's why we chose to take a one day tour to Colca Canyon, although Martin was skeptical from the very beginning. But if your time is not limited, this is not the only option how to experience one of the most incredible Peruvian wonders. First of all, we must say that visiting Colca Canyon with a tour is not the only possibility as you can get there independently. It makes sense to think about getting to the Colca Canyon on own when you plan on hiking for two or more days as coming there only for a day wouldn't do you justice money-wise and time-wise as well. The easiest way is to take a bus from Arequipa to Cabanaconde - bus leaves frequently almost every two hours, and the ride takes five hours. All three principal ways down into the canyon start (and end) in Cabanaconde. 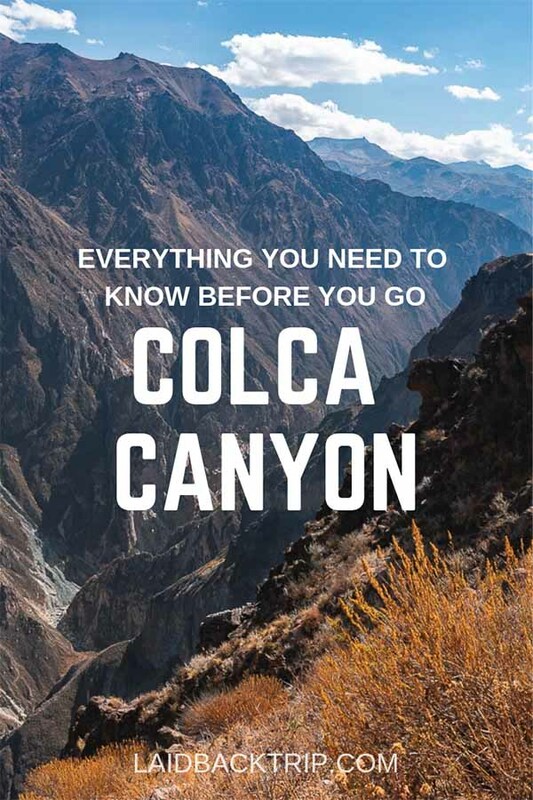 The other and the most popular option how to get near the Colca Canyon is taking a tour taking a tour, and it doesn't matter if you plan on spending there just a day or more. There are plenty of tour operators in Arequipa (the most of them have an office near Plaza de Armas), but every single hotel is able to make a reservation for you. We booked with our hostel because we wanted to make sure that the agency won't forget to pick us up as in that case getting up at 2:30 in the morning would be very unfortunate. There are two main activities you can do in the Colca Canyon - simple sightseeing or hiking. Sightseeing | Usually preferred by travelers who have only one or two days. It includes lots of time in a van and many stops along the way which could have been skipped. We experienced this version, so more about it later. Honestly, the two nights option did not make much sense for us because people usually do the same activities as on a one day tour, only have more time to relax the first day (unless you want to do a short hike) in the afternoon while spending the night in one of the nearby villages (usually in Chivay). Hiking | Two or three days hiking in the Colca Canyon is what you can do if you feel active and adventurous. You can trek with a group or independently, there are simple accommodations along the way. Generally, all paths lead downhill to the canyon, so first, you must descend and then climb all the way up in order to catch your transport back to Arequipa. But the views along this hike are spectacular plus you will leave the crowds behind. A huge downside and also a reason why many budget travelers skip this attraction is the steep entrance fee. Even for one day, you must pay S/70 per person (locals pay the significantly lower price) - there was an awkward check at the entrance when an officer came into our car and made sure that all Western looking travelers paid the high amount while Peruvian passengers were left out. We visited the Colca Canyon on one day tour, and here you can get an idea of how the day looked like. All agencies in the city run the same itinerary, so make your decision according to your budget and online reviews. The price for a tour varies from S/55 to S/70, only breakfast, guide and transport is included. The day started early as the minivan picked us up at 3 AM in our hostel. At the very first sight, we could see that we are (as usual) the only foreigners in a large group of Peruvian travelers. It would be perfectly fine for us, but unfortunately, our bilingual guide did not speak much English, and we noticed that the explanation for us was always much shorter than in Spanish, also we had to help her with vocabularies often. Because it was early in the morning, we all fell asleep and woke up around 6 AM when our van stopped at Mirador de Los Volcanos. It was a bit of shock as we were all of sudden at 4910 meters above sea level. Views from this mirador are amazing as we could see several volcanoes around more than 6000 meters high, but to be honest, we were all a bit drowsy at this hour, at this altitude plus the climate was too cold. After approximately 10 minutes we were back in the van and carried on to Chivay where we had a very average breakfast. If you don't handle high altitude well, you might want to stay a day extra in Arequipa to acclimatize. We arrived from the capital Lima via Nazca, home to mysterious Nazca Lines, and the morning was pretty rough. Then we made two stops in villages along the way - in Yanque where we could watch a traditional dance - the nicest thing on this stop were dresses dancers wore, and in Maca a village with a pretty church but too many vendors and ladies who pose for tourists with a condor or alpaca. There is also an option to visit hot springs in Yanque on the way back for an extra fee, but no one from our group wanted to go there, so we had more time for the Colca Canyon. Finally, after those compulsory breaks, we got a glimpse of the canyon for the first time. There are several viewpoints where the van stops so we had plenty of time and opportunities to enjoy the scenery. But the most famous and also the most visited viewpoint is Cruz del Condor from where we could overlook the immense canyon. We had more than an hour here, so we could stretch our legs a bit and walk the short path along the canyon's edge. On the way back to Arequipa we stopped in Chivay again for lunch. It was a buffet and cost S/30 which seemed too expensive for us, so we walked a bit further where we found a restaurant where we paid only S/10. You might think that the price for lunch is ok, but when we travel long term, every meal over our budget makes difference, plus every food in South America (after four months) taste a bit dull no matter how much it cost. The nicest part of the tour (apart from the Colca Canyon) was the way back to Arequipa. It was dark when we rode this highway in the morning, so on the way back, we could enjoy the beautiful scenery while we were crossing Salinas and Aguada Blanca National Reserve. We arrived to Arequipa around 5 PM, one would say it was a pretty long day. IS THE ONE DAY TOUR TO THE COLCA CANYON WORTH IT? There were three highlights along the way - the canyon itself, Andean condors and the drive from Chivay to Arequipa which was truly spectacular. Unfortunately, all other stops were unnecessary and artificially prolonged the already long day. It might be our fault that we don't enjoy shopping, don't want to take a picture with a lama or don't make thousands of selfies and that's why we found some stops annoying. Also, we already visited a beautiful, but not well-known Sonche canyon in Northern Peru near Chachapoyas, so we maybe were not blown away by the Colca Canyon as others. Don't take us wrong it is a spectacular sight, but we had a feeling that we've seen something similar before and the overpriced ticket did not help increase our excitement. We don't want to put you off from visiting the Colca Canyon, only want to warn you what you can expect on a one day tour. If we would visit the Colca Canyon next time in the future, we would have spent there more time, at least two days or three days. People living in the villages near the Colca Canyon for centuries still live (more or less) and dress traditionally. They are descendants of two groups, the Cabanas and the Collagua. Those two groups lived in a conflict for a long time, violence among them was not an exception, and they even performed cranial deformations not to look similar. Fortunately, those days are over, but until today people living in this area wear distinctively shaped hats to distinguish themselves. Arequipa belongs among the biggest cities in Peru, but the atmosphere in the center is relaxed, and we wouldn't guess it has almost 800 000 inhabitants. Plaza de Armas creates Arequipa's core, and it is also the most lively place in the city. But the most notable attraction to visit is Monastery de Santa Catalina also known as a city within a city. The monastery was founded in the 16th century and accepted only rich women who, after enrollment, had to live and pray in the monastery until their death. The area is large, and we spent there more than three hours wandering the beautifully restored, blue and red streets and exploring the old nuns' houses. The entrance fee cost S/40 which is quite expensive for Peruvian standard, but the monastery looked on pictures too nice to be missed, the guided tour was informative and enjoyable, and you should consider to include it in your Peru itinerary. Arequipa offers a large network of reasonably priced hotels, and you don't need to stay anywhere on the outskirt. Budget: Positive Hostel & Backpacker - cheap, centrally located the gate is locked all the time for the security and the breakfast is included. You can also book your Colca Canyon tour here. Mid-range: La Plaza Arequipa Hotel Boutique - it is hard to beat the location on the Arequipa's main square. Luxury: Grace Valley - featuring a garden where guests can relax, only a few blocks from the city center, this hotel is a real treat for those who can splurge.